This wildlife tour covers two spectacular parks of central India Bandhavgarh & Pench, both unique & diverse. 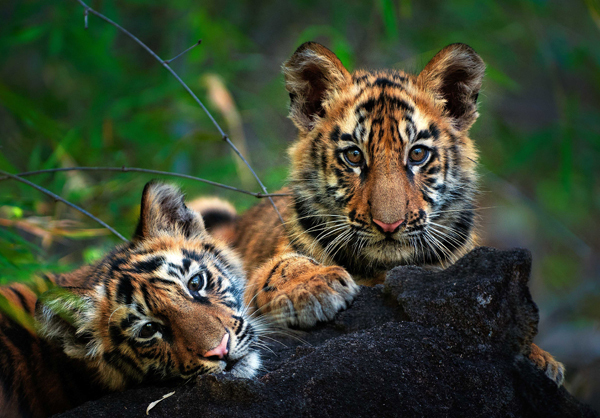 Bandhavgarh is a Sal forest a stronghold for Tigers and probably the best place in the world to sight one. Pench is primarily a Teak forest also popular for Tiger & Wild Dogs. Pench is the forest which inspired Rudyard Kiplings – The Jungle Book. Pench Tree Lodge is a unique boutique experience, set in one of the least explored areas of the Pench National Park. Located in the picturesque village of Sarahiri, the lodge offers its guests proximity to the Karmajhiri gate, and closer home, access to 16 hectares of private forested land to explore and observe the occasional wildlife at close quarters. While at the lodge, the tastefully done up Tree Houses offer a serene slice of wildlife heaven, perched high up on a tree, surrounded by undisturbed rolling acres of jungle shrub and trees. The six tree houses are private cocoons and yet, are at an easy distance from the dining and recreational spaces. Pench National Park established in 1975 harbors one of the highest densities of prey animals, chased by an estimated 65 Tigers. The landscapes of scrublands, deciduous forest of Teaks and many lakes, streams and Pench River can be instantly associated with the incidents and wild mentions of the animal life in the jungle book of Sir Rudyard Kipling. Pench is popular for Tiger, Wild Dog, Indian Gaur, Jackal & Leopard besides many other mammals & birds. Day 04: Pench National Park After breakfast drive to Pench Tiger Reserve (8 Hours). Evening at leisure followed by an early dinner. Day 05: Pench National Park Morning and evening jeep safaris in Pench Tiger Reserve. Day 06: Pench National Park Morning and evening jeep safaris in Pench Tiger Reserve. Day 07: Pench National Park Post breakfast, transfer for further connections. Tour cost: USD 1420 per person on twin sharing. Above tour rate is valid till 15th June 2019. Get 20% off for travel between 6th January 2019 to 31st January 2019. Get 20% off for travel between 1st May 2019 to 15th June 2019. All meals (6 breakfasts, 6 lunch and 6 dinner) and tea/coffee service. Four shared jeep safari in Bandhavgarh with entry fees, jeep charges and guide charges included. Four shared jeep safari in Pench with entry fees, jeep charges and guide charges included. Road transfers by air conditioned Toyota Innova between Bandhavgarh and Pench. Above rates valid till 30th June 2019.. Guests who have paid by online credit card will have to also sign a further authorization at the lodge on arrival and present the original credit card. Our standard check-in time is 1330 hrs and check out time is 1100 hrs. Park is closed on Wednesady afternoon and on major festivals. The forest department may close the park due to rain also on short notice. Pench jungles provided the inspiration to Rudyard Kiplings - The Jungle Book. Also popular for Tigers & Wild Dogs. Stay in Tree Houses in a large forested estate. Surname* Select one option Mr. Ms.